Once your device gets broken or becomes outdated, you get to choose what happens with it. Trashing it would be the worst choice you can make because electronics are bad waste. Instead, there are so many ways to dispose of old electronics responsibly. If you are not sure what to do with your old electronics, we have some solutions you could try out. 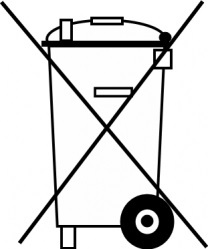 Avoid throwing your electronics in a trash can. Once they reach the landfill they can poison the environment due to many toxic substances that can leak out. Electronic products can contain substances such as cadmium, mercury, and lead, which must be disposed of very carefully. In addition, most of the electronic gadgets are made out of precious materials. In order to obtain those materials for production, they had to be extracted from somewhere. To try and repair the damage made to the environment in this process as much as an individual can, you can recycle your old electronics and the components can be re-used in the production of new devices. If your device still works properly, why would you throw it away or let it sit on your shelf? You can always make some extra cash by selling it online or to a friend. Or, you can donate the product to a reuse organisation which can make some use out of it. Here is what to do with your old electronics instead of letting them sit on your shelf. You can always try using eBay to sell your used electronics. Basically, eBay allows you to sell almost anything and you get to choose the price or choose to auction it. Make sure to check if there are other products similar to yours on eBay so you can set a reasonable price. No one is going to buy an overpriced product, especially when it comes to old electronics. Selling used electronics such as your sat nav, portable speakers, baby monitor etc, has never been easier. As long as it works, or in some cases even if it doesn’t work some people may still buy it because they know how to repair it or might need a spare part if they have similar model to what you’re selling. An easier method would be checking out if big chains are interested in buying your product. Selling on eBay can be time-consuming; you will have to deal with the packaging and shipping all by yourself. But, on the other hand, selling your product to someone who will resell it later on means getting less money. They have to be able to flip your electronics for a profit so they will offer you much less than the product’s actual worth. If you are good-hearted, think about donating your old electronics to charity. You don’t need it anyways, and those who are less privileged will certainly benefit from it. If you think that the previous method won’t work for you, you can try cashing in your old electronics at Cash In Your Gadgets. They help people trade in old electronics for cash and will pay you within two working days. This method is great and also secure because they make sure to remove any personal data that was left on your device. In addition, they are also eco-friendly. So, how does this method work? All you have to do is go to their website. Then, you choose what type of an electronic device you’re selling and its brand. After doing so, you get to choose the condition of your device which, of course, affects the amount of money you can get for it. Once you do this, you will get an offer for your old electronics. Cash In Your Gadgets can pay you via PayPal, cheque or bank transfer. They also take care of the shipping. Whenever you are unsure what to do with your trash, the best choice is to recycle it. But, how to recycle electronics? Well, it is the same as recycling any other type of waste – take the items to your local recycling centre. If you’re unsure where your local recycling centre is located visit Recycle Now. Recycle Now is England’s national recycling campaign supported by the government. It is managed by WRAP and used by more than 90% of English authorities. WRAP can help businesses, as well as individuals to recycle and help protect the environment. 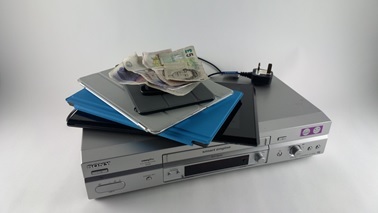 If your used device still works, there is probably a local charity shop or a non-profit organization that would be happy to take it off your hands. In many cases, they are even willing to take a gadget that does not work. They can fix it and then sell it in their store. Of course, a certain percentage of the money earned will go to charity. The process is very simple. You go to the charity shop and leave the item there. Some foundations, such as the British Heart Foundation, offer booking a free collection of old electronics from your home. You can visit this link to find your local charity shop. In some areas, there may be no charity shops that accept electrical donations, if that’s the case, try contacting the Furniture Reuse Network. They may be able to help. For UK taxpayers, do not be surprised if you are asked whether you want to Gift Aid your donation or not. Gift Aid means that the charity gets an extra 25p from the government for every £1 they get from selling your item. Last but not least, if none of the methods above work for you and electronic disposal is out of the question for you, think about giving your old electronics to a family member or a friend. They will appreciate it and probably use more often than you do.